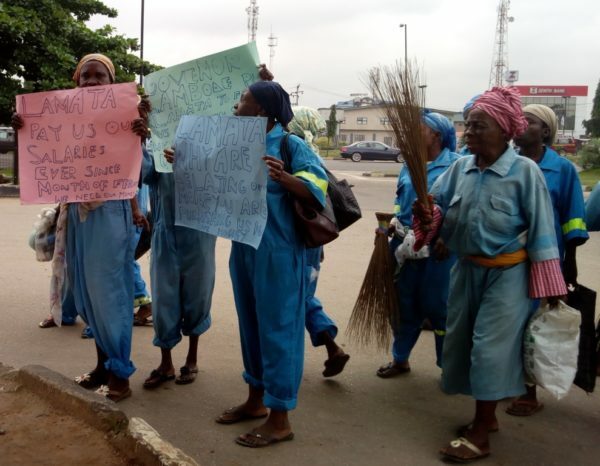 Sweepers employed by Dafunol International Limited, a contractor engaged by the Lagos Metropolitan Area Transport Authority (LAMATA) on Monday staged a peaceful protest over the non-payment of their five months’ salaries. The sweepers who were in their sweeping kits and holding brooms spoke to the press in front of Motorways Premises, near 7-Up bus stop, Ikeja. The protesters carried placards with inscriptions appealing to the management of LAMATA to pay them their salaries. They said they were employed by the contractor to sweep the LAMATA-constructed bus shelters along Mile 12-Ketu –Ikorodu Road –Tafawa Balewa Square (TBS) axis. They said that they had not been paid since March, 2017. Musiliu Akindele, a 70 sweeper, said that their employer initially payed each sweeper N10,000 per month before increasing it to N15,000. “We were only paid for January and February, 2017. Our employer owes each of us five months’ salary arrears. Most of our children have been sent out of their schools over unpaid fees,’’ she said. Akindele said that before now, their employer would supply them brooms to work with. “But now, we are responsible for them. 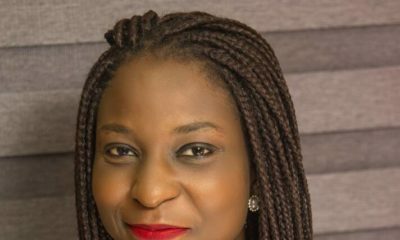 With the non-payment of our salaries; we cannot afford them and this is affecting our service,” she said. “Each broom costs N200 and now that the salary is not paid, we have no means to buy them to work,’’ she added. Another sweeper, Morufat Egunjobi, who covers the LAMATA bus-stop shelters around Ketu said they usually work between 6 a.m. and 5 p.m., Mondays through Sundays. “Some of us who could not cope with the harsh situation have stopped working, the rest of us are doing it on empty promises that we will be paid one day. “We are indebted to food sellers and they had refused to sell to us on credit anymore,’’ Egunjobi said. Also, Mero Raifu, another sweeper said that she had cultivated the habit of trekking from Ijora-Badia to Costain where she was assigned LAMATA bus-stop shelters to sweep. Mojisola Adejuwon said that the sweepers had two meetings with their supervisors early in the year where they highlighted their plights and there was an assurance from the supervisors that they would pay them. “We have to resort to this peaceful protest today because our supervisors seemed to have reneged on their promises,’ she said. Abiodun Omaike said that he had been taking care of his family by borrowing from his neighbours. “I live around Moshalashi-Idioro on Lagos Mainland while I am assigned to sweep four bus-stop shelters around Fadeyi and Onipanu every day. “Instead of sweeping one bus-stop shelter, each sweeper is assigned to sweep between three and four on daily basis and we do not complain. “Despite this multi-tasking, we are still being owed salaries by our employer. “We are pleading with our employer: LAMATA and Dafunol International Limited, its contractor to pay us our standing salaries. 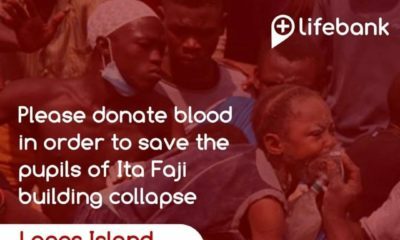 “Through that, we will have money to take care of ourselves and be able to work efficiently,’’ Omaike said. Kola Ojelabi, Head of Media and Communication, LAMATA, was contacted, and he said that the state government was processing the funds for the payment of the sweepers. My first thought was this is not like Lasg. Then I was right, the contractor is the one owing them salary, I bet you Lasg already paid the contractor. This is still an embarrassment to Lasg. They should fire the contractor and also force him to pay. Their should be a clause regarding this in the contract-protecting the workers or not doing anything that would embarrass the government. How can they buy their own tools. Please let us know the name of the owner of the company. Please pay these people their money. Why are humans so wicked to each other? We are our greatest problem. You expect them to also buy cleaning tools from their meager earnings?!!! I see some of these cleaners on the high way endangering their lives to earn a living yet ordinary N15,000 LAMATA can not pay but you expect them to keep working despite owing them for 5 months?!!! This is so unfair! Abeg God intervene already. And you’ll see their managers spending over 10 times their monthly salary over pepper soup and alcohol…parties and vacation… This world is wicked.. Stories like this are annoying. Even in abia too. Civil servants are being owed for 8 months. Oh my God. Paltry salary, yet non-payment. This is so sad. It’s inhumane tbh. Just look at these women. Later when these women wake up early in the morning, and stand facing the rising sun stark naked to curse the contractor and his generations to come, because of their plight, they will say people are wicked. I have seen these women on the streets of Lagos and commend them highly…taking in so much dust and exposing themselves to health hazards because LASG cannot afford to buy street sweeping equipment. What a shame?